I arrived in the city late in the afternoon and drove the van along it's perimeter roads before loosing myself on an inner-city cruise. 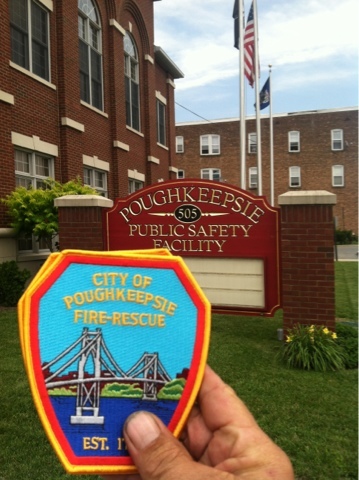 Before settling-in by the riverfront, I stopped in at a fire station to ask for a business card as a souvenir of the beginning point in "upstate". Surprisingly, the Captain gave me a patch. 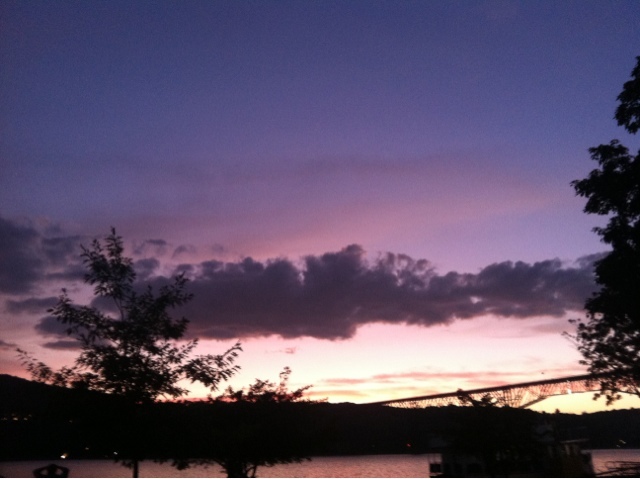 The riverfront in Poughkeepsie is a perfect area to relax by the river, picnic or walk the pedestrian walkways. An elevator can take you to the deck of the recently completed walkway over the Hudson River, or you could walk a little further to the base of the repurposed train trestle and walk the longest pedestrian bridge path in the country. I walked the dog. From plaques along the pathways I learned some history of the families who made Poughkeepsie great. Back at the park area I sat at the van, with an awesome view of the river between two tall bridges, and did some work on the phone while Nice (the dog) lay on his blanket beside the van sleeping. The people in the park, families with children, joggers and tourists gave way to the local men with polished rims and modern sound systems. Several of them synced together their devises, filling the parking area with hip-hop and rap with base so deep it rattled my windows. Nice was born in the West end of Louisville in a similarly loud area, the waves of sound acted like a lullaby to him and he refused to even lift his head from the blanket when I asked him to get up and get into the van. It would not have mattered, the van was blocked in by the young men's cars. As more congregated under the shelter beside the parking lot some looked suspiciously at the stranger in the purple van, wearing a feathered cowboy hat. The music was turned up, Nice (the dog) was immovable and unconcerned. Overhearing some of their conversation it was decided that the dog was "chill", therefore I must also be. (Or something along those lines...I'm old, and white.). The wind picked up and the sky darkened with clouds. It wasn't until large rain drops began to fall that Nice arose from his blanket. Rather than going to the van he walked toward the shelter where the men were standing. I coaxed him into the van as the front blew through with a fierceness that made the tall trees overhead creak and sway. Half of the men ran to their cars and drove away while the others stayed in the small corner under the shelter that remained dry though the lightening and thunder claps that had been six seconds apart. The lightening and thunder were now on top of each other. Soon Nice and I, closed in the van, had the parking lot to ourselves. As darkness fell over Poughkeepsie I drove to the nearest large parking area along the road out of town, where we would begin the next morning. I parked at my home away from home, Home Depot.